I trained at the WPF Counselling and Psychotherapy Institute in central London, recognised as one of the leading training organisations in the UK, and with a reputation for its clinical and academic excellence. I graduated with the advanced diploma in psychodynamic studies awarded by the University of Surrey. I am a professional member of the 'Foundation for Psychotherapy and Counselling' and the 'British Association for Counselling and Psychotherapy'. These professional bodies ensure a strict code of ethics and the highest standards of practice and confidentiality. 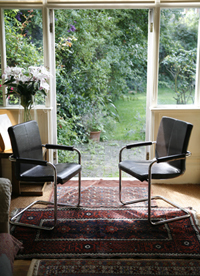 Psychodynamic counselling/therapy is concerned with the interaction between two people, the client and therapist. My experience, working both privately and in the NHS, has taught me the value of approaching each client as a unique individual.